Sugar Almonds Mixed are ideal bonbonnieres for weddings. These have stood the test of time and are still popular to use at weddings. With a superb taste, they present beautifully in pastel colours. 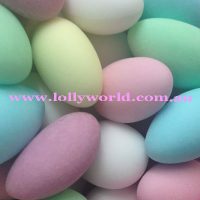 They have a sugar candy coating offering a hard crunch with a delightful almond inside. There is approximately 24 in a 100g bag, 120 in a 500g bag and 240 in a 1 kilo bag. The sizing of the sugar coating can vary so these numbers are approximate only.